The choice of a decent web building platform is one of the burning issues for millions of users across the globe. With dozens of trusted website builders available out there, selecting the one that will ideally come up to your needs, requirements and preferences is frequently a challenge. This is because not all the systems are created equal. Some of them are mainly targeted at non-tech savvy users, while others are created with the needs of professionals in mind. To make the right choice, you need to explore and test several systems at a time to see what they are ready to offer you. Today, we will talk about two powerful website builders that definitely deserve the attention. So, get ready to meet Adobe Muse and Squarespace! Both platforms come with a rich feature set and advanced functionality. Both of them unveil lots of web design opportunities and make it possible to create different website types. At the same time, each system has its own peculiarities and features that have to be analyzed individually to understand what benefits you can avail when using them. While Adobe Muse is mainly oriented on professional web developers, who wish to create quality websites without any coding effort at all, Squarespace targets creatives, entrepreneurs and online retailers. If you are currently interested in the features of both platforms and can’t decide, which of them meets you web building needs most of all, let’s analyze and compare them right away. Adobe Muse. The system primarily focuses on the needs of experienced web developers and, thus, may be a bit complicated for newbies, who have never used any Adobe products at all. It’s hard to call the service too complicated and confusing, but you will definitely need time and effort to explore its features and learn how to use the web design tools it offers to create a quality website. If you have graphic design background and are ready to learn, then Adobe Muse is the right choice for you. It doesn’t make any sense to explore and test the system, if you are not going to use it on a regular basis. There are many simpler web building solutions for such purposes. However, if you are looking for a system to be used for your web creation tasks in future, then learning Muse is a nice decision. The system is the downloadable software, which requires preliminary installation. This cannot be considered a drawback. Everything depends upon your preferences, plans and web design habits. If you have ever worked with Photoshop, Illustrator or InDesign, Adobe Muse interface won’t seem scary to you. Instead, it is logically structured and offers a set of options and features, the smart use of which will ensure stunning result. The service comes with a drag-and-drop editor, which is an extra benefit for those, who have at least a bit of web design experience. It takes time to master the system. Once you are done with that, you will definitely enjoy the web creation process itself as well as the powerful projects you will develop with it. Squarespace. Squarespace is a bit simpler in use than Adobe Muse. The system allows choosing and customizing templates depending upon the niche you specialize in. There is a feature allowing to launch an online store here, which is a real advantage for entrepreneurs willing to get their businesses online. The system comes with an intuitive and easy-to-understand dashboard, where all the elements are grouped to help you select the required settings. The menu of the service is lightweight and user-friendly. All in all, there are 6 menu sections here, each of which offers more options. The system is logically structured and convenient for users, irrespective of their web building experience. So, if you are a newbie looking for a chance to design a quality website with extensive functionality, don’t pass by this solution. Adobe Muse vs Squarespace. From the point of view of ease of use, Adobe Muse is a more preferable solution than Squarespace. This is especially true for users, who have already worked with Adobe products and know what to expect from them. For those, who lack such experience, the system unveils lots of opportunities that enable users to effectively master the system and start using it to build quality and functional websites. Squarespace may seem complicated at first sight, but it doesn’t allow creating powerful projects. This is a nice solution for creatives and small businesses willing to establish quick and reliable web presence with minimum effort and waste of time. Adobe Muse Review – read the Adobe Muse review to catch more details. Adobe Muse. Adobe Muse is packed with advanced features and options you can use to develop a decent project. Being meant for web design professionals, the software offers a set of tools, which is more than enough to get a full-featured website. The system has an impressive clear interface, which makes it possible to create your website layout by adding and editing content, buttons, menus, social media features and other elements, which contribute to the efficacy of any website. You can control each step of the project development, making the changes whenever required. One of the crucial advantages of the system is that it allows making the changes without going online. They can be made in the program any time of the day. As soon as the changes are made, you can update a website through FTP and watch the result. To make your website accessible on the web, though, you will need to set up hosting. This option is paid. It’s worth mentioning that Muse can be used both to create responsive websites and those that come with fixed width. Whatever web building purposes and objectives you have, the system will adhere to these needs. Adobe Muse offers an amazing set of tools you can’t go without, if you need a full-featured website. These include automatic text synchronization, self-hosted and Typekit premium web fonts, right-to-left language support, advanced customizable third-party widgets providing an ability to create and manage web stores and blogs etc. If you wish to launch an online store, though, the system doesn’t offer integrated eCommerce features. To reach the goal, you’ll need to connect extra plugins or online store building solutions like Shopify, WooCommerce, Ecwid, PayPal store, Sellfy eCommerce Widget, Snipcart eCommerce and more. Squarespace. Squarespace offers an impressive set of features, such as the built-in blogging system, an option allowing to add several website contributors, advanced export/import features etc. If needed, you can transport your ready-made blog to another platform. One of the most impressive Squarespace features is integrated eCommerce functionality. This includes inventory tracking tools, digital and physical goods, coupons, taxes, shipping, blogging option, product import, express checkout mode, abandoned checkout recovery, multiple currency use, XERO, Stripe and PayPal integration and what not. 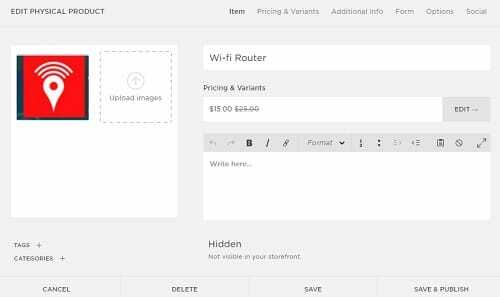 Squarespace does not offer standard template customization features only. It additionally allows designing websites by making use of code editing options. The system comes with Code blocks, Developer platform and Custom CSS area. The latter feature, however, is available to paid subscribers only. It’s also possible to integrate a third-party app in case of necessity. This depends upon your web building needs. The system has strong partnership relations with trusted companies, such as Disqus, Etsy, PayPal, BookingBug, MailChimp, Typekit etc. This cooperation contributes to the web building result you will avail. Adobe Muse vs Squarespace. Both Adobe Muse and Squarespace offer excellent functionality and options required to build powerful projects in various niches. The systems are meant for professionals and newbies, who wish to get the most out of their web building experience. The only feature that makes Squarespace stand out from the crowd is its eCommerce functionality. The website builder offers an opportunity to build an integrated online store and doesn’t require any extra plugins or extensions to do that. Adobe Muse, in its turn, lacks this feature and each user, who wants to set up an online store with the system, has to look for the third-party solutions to be integrated into their websites. This, however, is a benefit for many users rather than a disadvantage as it makes it possible to choose any plugin they consider suitable for their business type. Adobe Muse. Unlike many other cloud website builders, Adobe Muse doesn’t have any ready-made themes. What you get is a blank canvas you can use to design a website of your own. You may apply the entire set of web design tools to do that. These include videos, sliders, text blocks, footers, headers, buttons, social media features, menus and what not. Another design option you can go for is the use of custom layouts available on the web. They are paid and free and it’s up to you to choose what you need. These themes are developed by the third-party users (mainly web designers and agencies) and are uploaded to the global network so that other people could make use of them. On the one hand, this is quite convenient. You just select a theme that corresponds to your own niche and customize it as you need. On the other hand, though, this may be quite risky, because you can never be 100% sure about the quality of the template you will download. There is always a risk to deal with unreliable seller, who will offer you a template with a code that will eventually have negative effect upon your website performance in future. If you are ready for such challenges, then you are welcome to use this option. If not, then it really makes sense to spend some time mastering the system and start designing your own projects. Squarespace. 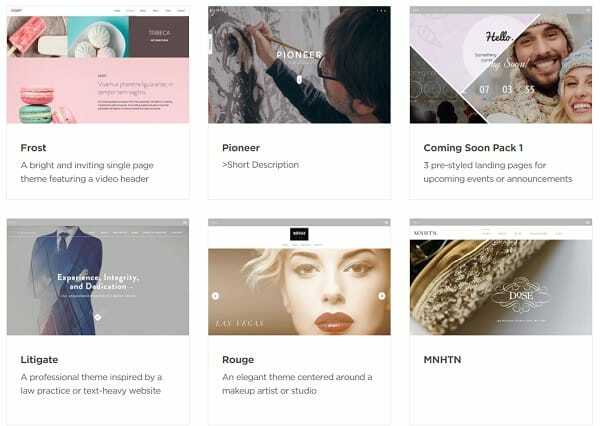 Squarespace offers a collection of quality ready-made templates, belonging to different niches. The themes are responsive by default and look engaging and user-friendly. The system offers seven design categories, namely Musicians, Restaurants, Personal, Commerce, Business etc. There is also a separate category of templates – one-page websites called “Cover Pages” used to present your company to the advantage in a precise and effective way. The templates are free for everyone. Whatever template you will go for, you can change it any time in case of necessity. What’s more, you can have a look at the way your website will be presented on different mobile devices by making use of the Device View feature. This is an important benefit for everyone, who plans to use mobile versions of their websites. Adobe Muse vs Squarespace. Both systems make it possible to create stunning websites, but they practice different approaches to the web design process. Adobe Muse doesn’t have any customizable template collections. Instead, the system offers an opportunity to create a website from scratch using a blank canvas and a set of design tools or download and customize a tailor-made Adobe theme from the web. This gives user a chance to get unique website design that will stand out from the crowd. Squarespace is a bit simpler in this respect. It offers dozens of thematic templates, many of which are specially designed for online stores. All the themes are free and mobile-optimized. 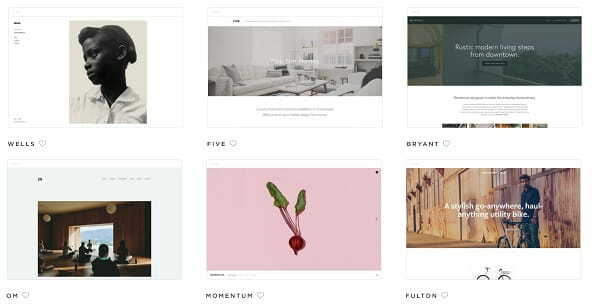 Squarespace Website Examples – take a look at Squarespace-powered sites. Adobe Muse. The system has a powerful customer support center. They offer official tech support as well as an extensive community base. There is a customer Care Page, where each user can get quick and quality assistance. Additionally, it’s possible to look for the tips and recommendations provided by other system users at the community forum. For those users, who are just starting exploring the system features, there is a chance to use multiple manuals, text and video tutorials as well as valuable Adobe knowledge base, which reveals all the nuances of the system performance and features. To get live support provided by the Adobe experts, you can either contact them by email or get access to the official website of the company and look for their contacts there. Squarespace. When it comes to customer support, Squarespace doesn’t lag behind Adobe Muse. The system offers an extensive knowledge base, which manifests itself through the community forum assistance, availability of video tutorials, manuals, FAQ section and other information resources. Apart from the knowledge base, Squarespace offers 24/7 email support and live chat, which is available on weekdays from 11am to 7pm EST. This is more than enough to find answers to all the questions you might have. Adobe Muse vs Squarespace. When it comes to customer support, both systems rank high. They offer their users an extensive knowledge base, abundance of educative materials, tutorials, video guides, FAQs, manuals etc. Community forums providing valuable tips and recommendations are also available here. There is an opportunity to contact system experts via email or live chat in case of necessity. This approach guarantees decent result. Adobe Muse. Being one of the most popular Adobe products, Muse is included into the Creative Cloud Package on the paid basis. You can either purchase the entire package (if you need several Adobe products at a time) or one website builder only. The monthly subscription fee constitutes $24.99, while the annual cost is $179.88. At the same time, the system offers a free 30-day trial, irrespective of the subscription plan you will go for. What’s more, you will separately have to pay for the hosting and domain name to publish your website. This will correspondingly cost you $5-$10/mo and $12/year. To give your website advanced functionality, you may also consider adding widgets to it. The widgets are also paid and free. ✓ Unlimited Storage and Bandwidth. Squarespace. Squarespace currently offers two pricing options. These are Websites and Online Stores. Each option encompasses two packages. Thus, “Websites” allows choosing Personal or Business plans that cost $16-$25/mo correspondingly, while “Online Stores” enables you to select Basic or Advanced plans, the cost of which constitutes $34-$52. The choice of the plan depends upon your web building needs and purposes. If you plan to build a simple website and are not going to use the Developer platform, then you can opt for the Personal Plan. More advanced web building needs require a more serious paid plan, offering extensive functionality. It’s up to you to make the choice. Adobe Muse vs Squarespace. Both systems are paid, but the cost you will pay for using their features may differ a lot. Adobe Muse is somewhat more cheaper, andit also offers enhanced functionality. By using the system, you can design a unique website, which is definitely worth the money invested. Squarespace provides different cost alternatives as well. The cost you will eventually pay, will depend upon the type of the plan chosen and the goal you pursue. The more functional and complicated website you need, the higher cost you will pay for it. Adobe Muse. Adobe Muse is convenient and advanced, but it’s not easy to understand it from the very first try. This is because the system has a bit complicated interface, which doesn’t differ a lot from the rest of Adobe products. However, if you have never worked with Adobe systems before, you’ll find it a bit confusing. As soon as you master it, though, you will realize that it’s user-friendly, logically structured and informative. Squarespace. Squarespace is primarily geared towards users, who don’t have rich web building background. The system doesn’t offer a broad range of features and allows building standard websites for personal or business use. The choice between Adobe Muse and Squarespace doesn’t have to be complicated. The systems differ from each other in the feature sets, options and designs provided. Squarespace is simple, convenient and user-friendly. You don’t have to possess coding skills to create websites with it. One of the major advantages of the service is extensive integrated eCommerce functionality, which makes it possible to design functional online stores. Adobe Muse looks seamless at first sight. It is functional, quality, convenient, logical and understandable for the prevailing amount of users. It allows building awesome websites even to those people, who don’t have coding skills. However, the system may seem a bit complicated to those users, who work with it for the first time and have never seen any other Adobe products before. Unlike Squarespace, Adobe Muse lacks integrated eCommerce features and it’s possible to launch a web store with it by connecting extra plugins. This, however, cannot be considered a disadvantage as a platform provides a chance to choose an eCommerce platform with regard to your specific needs, preferences and budget. Adobe Muse is definitely a more preferable system, the functionality of which allows creating websites with unique design and excellent performance.